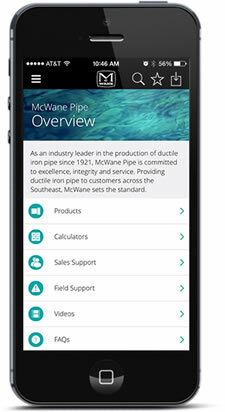 View the different joints and sizes we offer for ductile iron pipe. We are a proud and experienced manufacturer of ductile iron pipe products. At McWane, Corporate Responsibility guides all operational and business decisions to assure that we are operating ethically and in a transparent and accountable way. We believe that it is our responsibility to utilize our operational and technical knowledge to take actions that are protective of human health and the environment, as well as, the safety of our workforce, even if those actions are not necessarily required under applicable laws or regulations. We take our responsibility to operate in an ethical and legal manner in all spheres of our business very seriously. Every McWane team member is thoroughly trained on our Code of Conduct and associated ethics and compliance programs, with regular refresher training on crucial aspects. In addition, open, honest and effective communication with our team members and other stakeholders is a critical part of our corporate culture. Treating our team members, neighbors, public interest groups, governmental agencies and customers with respect and courtesy and serving as a valuable asset to every community where we have a business presence are core values at McWane.